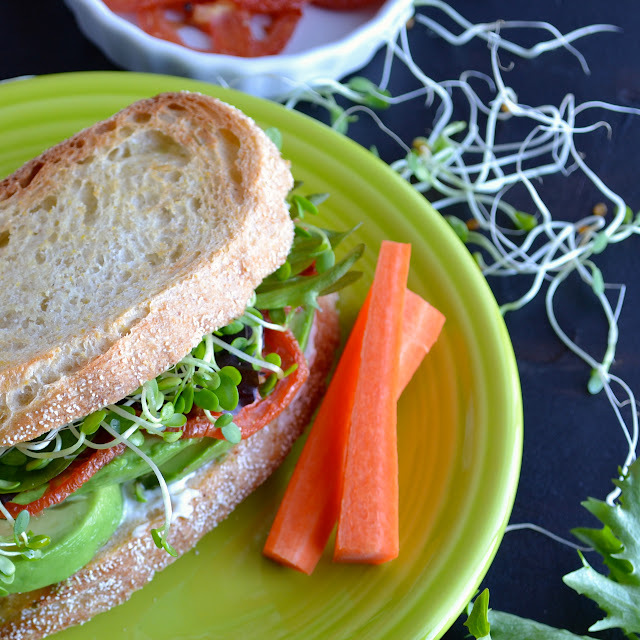 This sandwich was inspired by a similar veggie sandwich I had eaten while out to lunch with a friend. I recreated it for my daughter Katie, then we personalized it with things we love until it evolved into what Katie calls The Totally Awesome Sandwich. It’s our favorite. We started making this sandwich in the summer, when tomatoes are at their best. This time of year, it’s hardly worth using fresh tomatoes, so we use roasted tomatoes. For these sandwiches, I used my mandolin to slice the tomatoes very thin and roasted them for one hour at 300 degrees. They come out of the oven with so much more flavor than when they went in! This sandwich also includes lots of sprouts. If you don’t think you like sprouts…try them at least once with this recipe! They taste awesome in this sandwich. You may want to start off with alfalfa or mung sprouts. They are some of the most mild in flavor. There really are so many different varieties, but they are all super nutritious. Sprouts are full of enzymes, minerals, antioxidants and even protein. They have one of the highest concentrations of nutrients per unit of any other food. 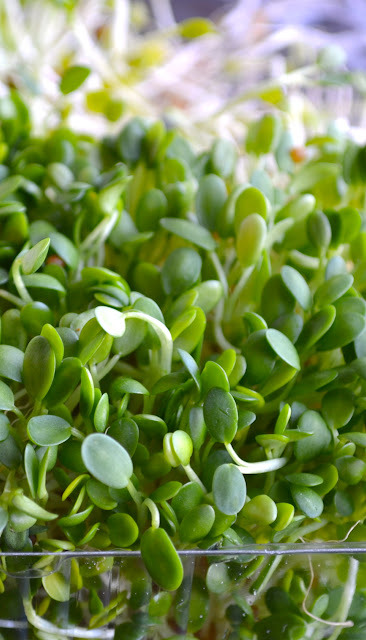 You’d have to eat an awful lot of the same plant in its mature state to match sprouts’ nutritional values. They are also easier to digest at the sprout stage than in their mature stage. There are so many reasons to give them a try! Spread mayonnaise or Vegenaise on each slice of bread. Top one slice with the avocado slices, then the tomato, mixed greens and sprouts. Top the sprouts with the salsa then the other slice of bread. I usually like to use one of the Ezekiel Breads from Food for Life, but this time I couldn’t resist a beautiful crusty Calabrese bread in the bakery. Whatever you use, make it a bread you love. It makes all the difference. After the bread, my favorite part is the avocado! To easily slice the avocado, cut it in half, and slice while still in its peel, then scoop the slices out carefully with a large tablespoon. Ooooh…oatmeal bread sounds SO yummy! This would be delicious with it! I hope you love it as much as we do Donna! Thanks for your great comment! Made me smile! Awww…thanks Maria! I’m so glad you like this! It’s one of my favorite sandwiches! Hi Caroline — You were so sweet to comment on my pinterest board! I thought it was cute when you said that my posting made your day because then your posting made my day! : ) I can see why you and your daughter call this “The Totally Awesome Sandwich” because it is indeed awesome! It’s now one of my favorites. About a month ago, I started to make a change to eat healthier and your website has been a big inspiration. Thank you so much for taking the time to create these recipes and especially for sharing them! Oh, Kristin, you are awesome! Thank you so much! Nothing could make me happier than to hear that some of my recipes are part of your journey to eating healthier! I do love this sandwich and the funny thing is, it’s so simple, but the comination of ingredients on a good bread is so surprisingly delicious and satisfying! I’m so glad you stopped by to comment…you made my day again! You’re so sweet Lysa! I love that you grow your own sprouts! I do that too sometimes. It’s fun to watch them grow and they are so fresh and crunchy. Thanks so much for stopping by! wow this sandwich looks delicious, I make my own sprouts and they always fit in any recipe. Your photos are beautiful ! This looks like a nice mix of vegetables. We’ll have to try this one! So glad you think so, Amanda! Thanks for taking the time to comment. I hope you love it as much as we do. Let me know! This sandwich looks so amazing. I love that you put salsa on it. I’ve never tried sprouted bread, but I might have to- I’m really trying to cut back on my carbs. But a calabrese loaf…. YUM! Thanks so much for the kind words Mallory! I love the salsa on the sandwich, there’s not a lot of it, but enough to add flavor and jazz it up. I started using sprouted bread this summer. I like it a lot. You’d hardly know it was made with sprouts. It has a nice texture. I love it toasted. Let me know if you try it!